With Berlin as her adopted home, Claudetta has poured her soul into decorating and her passion for Nordic interiors. Emblematic of the en vogue Scandi style in the German capital, her central apartment brings various elements together in harmonised unity. The result? 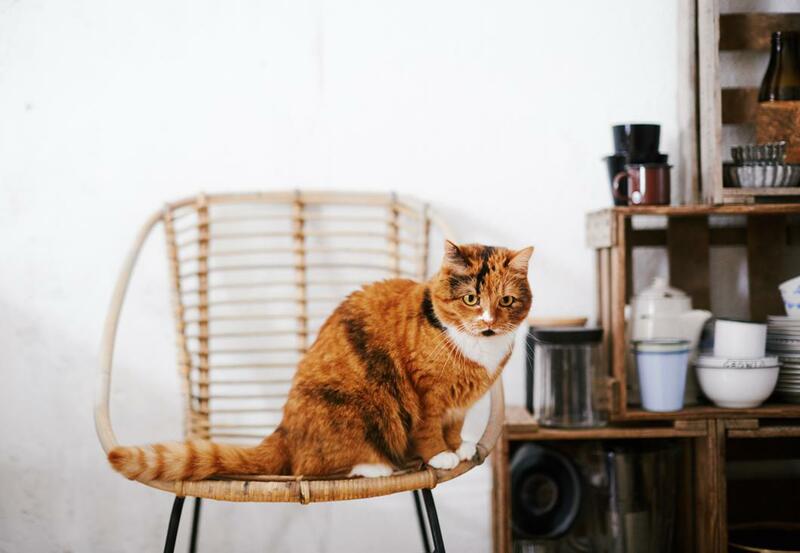 An interior that is both cosy and photogenic, with vintage furniture, exposed concrete, retro objects, graphic art, succulent plants and a friendly feline. We paid her a visit one afternoon to drink coffee, talk about her passion and swap some style advice. Originally from neighbouring Brandenburg, Claudetta studied in the picturesque city of Potsdam. It was there that she began writing and taking pictures for her DIY blog ‘Do it, but do it now’. During a stint as an estate agent, she discovered a natural instinct for décor and photography, and found hew new vocation. 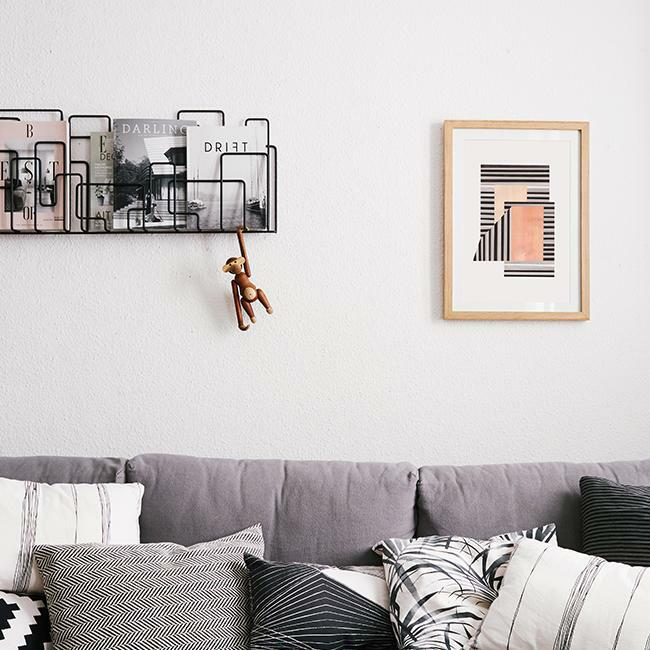 Today, she has thousands of followers who trust her impeccable taste and take inspiration from her apartment visits, DIY tricks and interior tips in Berlin and beyond. I’m constantly on the move and love the speed of Berlin, the possibilities of this city and the constant inspiration that emanates from this hustle and bustle. She and her boyfriend were already both residents of Berlin's Mitte district, the beating heart of the city, when they decided to move in together. They found their home sweet home a little farther on the border to the trendy district Prenzlauer Berg. Filled with toasty cafés and vintage shops on cobbled streets, they instantly felt at home—the perfect place to create a cosy nest to brave the Berlin winters. Straightaway, her apartment envelops us in an warm and intimate atmosphere. Soft, folded blankets rest on rattan armchairs, cushions are neatly arranged on the sofa, the aroma of third wave coffee wafts from the kitchen. It’s the kind of home you could imagine settling down with a good book in—Swedish in style, uncluttered with room to breathe. 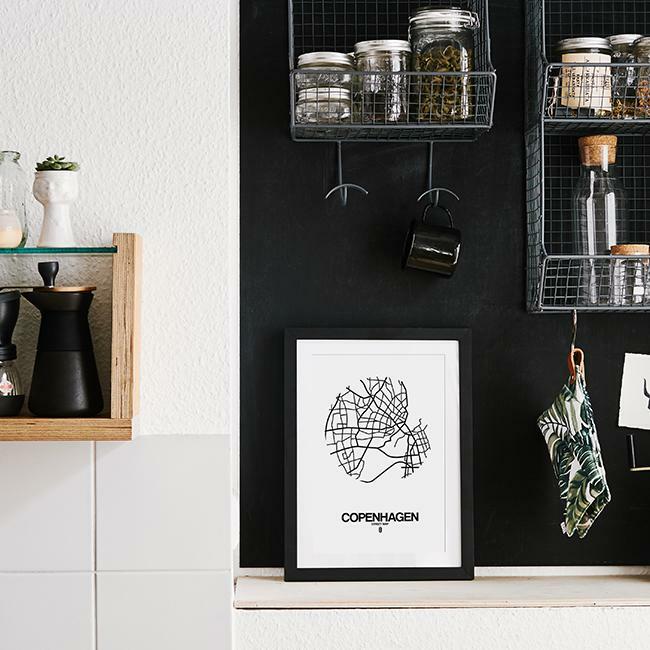 “I would describe my flat as casual, original and comfortable.” The Swedes have a concept to echo Claudetta’s words: lagom. This Scandinavian trend is all about finding the balance, or middle ground. Not too much, nor too little. Away with the clutter of accessories, give a work of art room to breathe and space to speak for itself. For example, “Asymmetrisk” by Mandy Rep. I wouldn’t describe myself as colourful—I tire quickly so I’m scared of getting bored too soon. That’s why we picked light and natural colours for the flat. Bright and full of natural colours, in Claudetta’s apartment, each object has its place, meticulously selected to blend into the whole. A cue taken from Scandinavian design, which she describes as a “clean but natural” style. To achieve a warm, yet minimal lagom spirit, she opts for shades of beige (ecru, eggshell or vanilla) or grey (taupe, mastic or silver). With a yearly blessing of six months of light and curse of six months of darkness, this is not a detail to be overlooked in northern latitudes. From Oslo to Helsinki, interiors are clear and the windows large to let the sunlight in all year round. 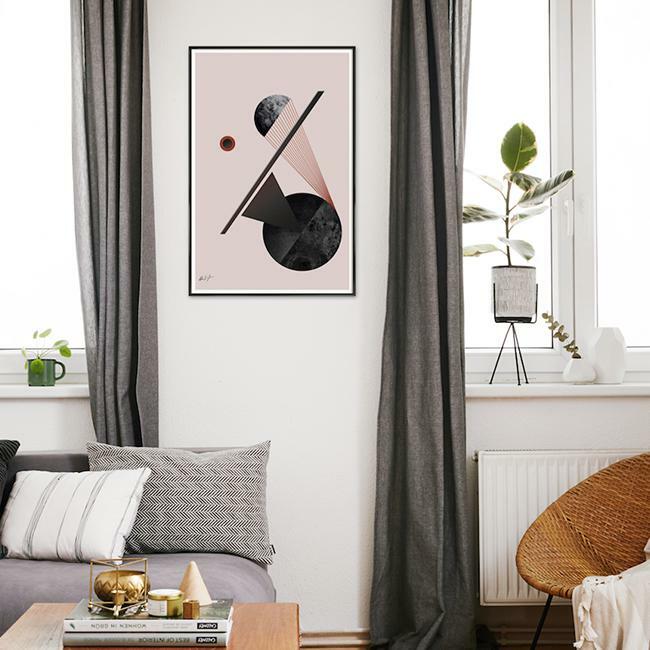 We arranged some neutrally-coloured works such “BAU1” by Andreas Jarner in a bright corner of the living room. Claudetta’s two greatest strengths are her ability to find inspiration everywhere and her infinite curiosity. When she’s not wandering around the city with her trusty camera in tow, Instagram and Pinterest offer her a virtual tour of homes around the globe from the comfort of her couch. An adventurer at heart, she needs a change on her walls almost as often as she needs a change of scene. 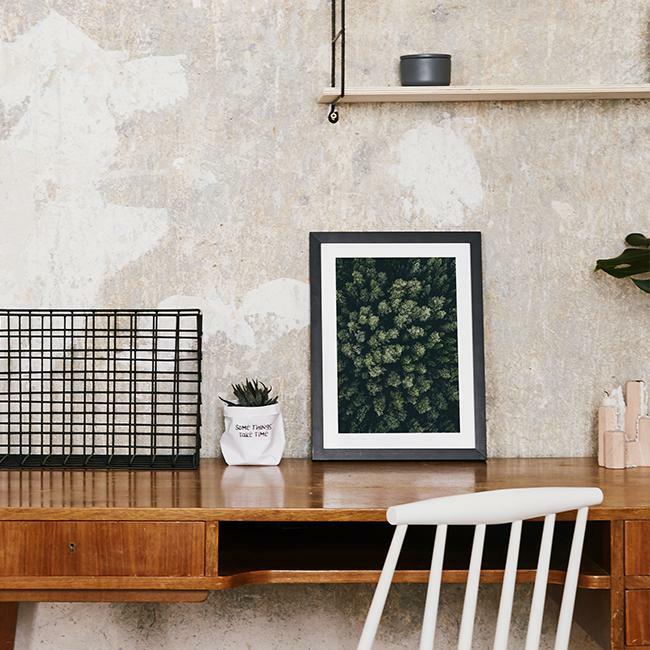 Sometimes she likes to leave walls bare to expose concrete, other times she picks artworks found at flea markets or chooses prints from artists online. Our curators advised her to give free rein to her vagabond spirit with designs that will remind her of her travels, for example, “Copenhagen” by Naxart. I’m really into rattan at the moment, and we have a lot of wood in the flat. To counterbalance the neutral tones of the furniture, Claudetta has developed a penchant for wood. High-quality woods from the 60s and 70s, with some added character from the odd journey through the city, alongside plywood and rattan form shades which break the uniformity of colours. Forest landscape photography is the perfect accompaniment, creating a soothing feeling and a promise of the outdoors. Our curators chose “Jungle Rum” by Airpixels Media. But alongside the cosily arranged furniture and well-placed accessories, what really makes Claudetta’s home come life is Tigerlily, the cat. She struts proudly between kitchen and living room, always ready to snuggle on the sofa. This is something to which Claudetta is very attentive when hanging her paintings, keeping them out of paws reach. So what’s on the horizon? Claudetta has been wanting to redesign the living room for a while—by changing the furniture layout, the fabric of the sofa and the colour of the walls. But deep down, she dreams of a bigger apartment with even more space for Scandinavian furniture and wall art.